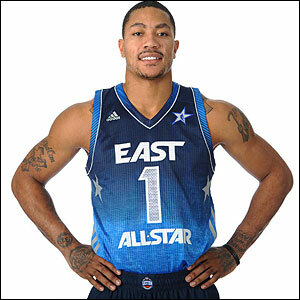 Rose was the leader among East guard in votes and second on the East team in votes to Dwight Howard. LeBron James was third and Dwyane Wade fourth. Rose will start with those three and the Knicks’ Carmelo Anthony. Overall, Rose received the third most votes from fans with Kobe Bryant second. Bryant will start for the West with Kevin Durant, Blake Griffin, Chris Paul and Andrew Bynum. “It means a lot,” said Rose. “I remember just wanting to be in the All-Star game. It’s something I take to heart. I wanted to accomplish something when I got into this league, and one of the accomplishments is being on the All-Star team. It’s an honor. “It means a lot for the fans to vote for me,” added Rose before playing the Knicks. “I didn’t realize I had all those votes. I’m appreciative. I don’t take any one of my fans who went on line and voted for me for granted. I appreciate them all and hope they continue to watch me. “It’s definitely fun playing on a team like that where everyone one of them are different type of leaders,” said Rose. “And me being a young player it’s something I can take from there and add to this team. Rose was asked about having to thus practice his lob passing and he laughed. No, not on his Bulls team. And it should be quite a show with Rose again running with Wade and LeBron.